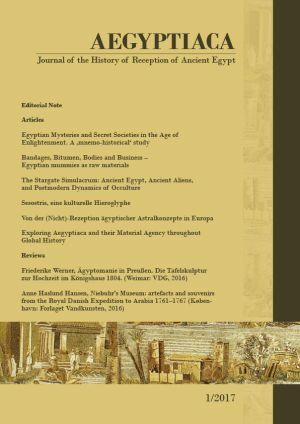 Aegyptiaca is an international open access journal, published by the Department of Egyptology, University of Heidelberg. It is dedicated to the documentation and research of the history of reception of ancient Egypt. The journal will be published biannually in English language and will accept German and French articles as well. The journal tries to encourage a coherent discussion of the concept and agency of Egypt in the West. As this topic is an object of research in many different disciplines the journal tries to cover a whole range of fields and all periods of the history of reception of ancient Egypt and it is open to different approaches and methods. By doing this the journal tries to keep in mind the question if and in which regard the confrontation with Egypt was a relevant factor of cultural history. The journal will publish articles focussing on special aspects of the history of reception of ancient Egypt in the different testimonia (may it be texts, art or objects) and intends to understand the detailed aspects as part of a bigger story at the same time. News are available at the Thematic Internet Portal in Propylaeum.